And school’s out for summer! Can you believe it? I can’t believe it. I don’t know how the rest of you feel when the kids are home all summer, but I always vacillate between total contentment that we’re all together and absolute despair that my house will never be clean (or quiet) again. I haven’t figured out how to solve the noise/mess problem yet, but I DO have a fun art project today that your kids will love: personalized coloring pages. 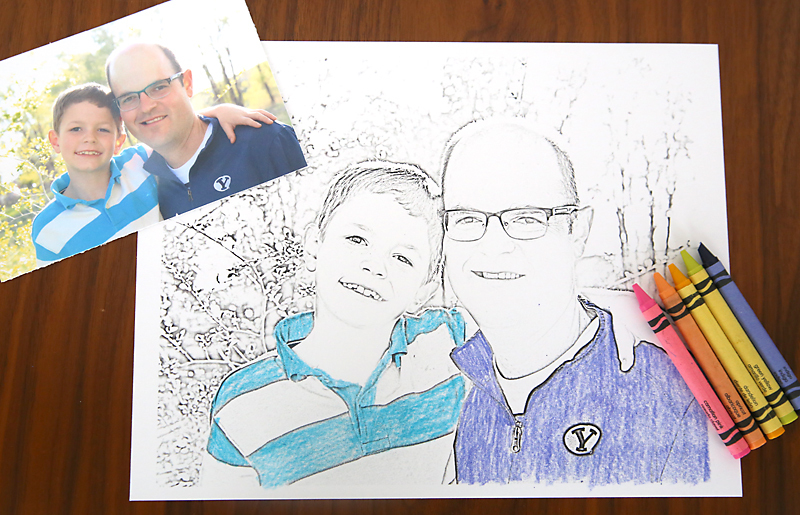 Yep, that’s right, you can take any photo and turn it into a coloring page for your kids. It’s awesome! My kids have never been the type to sit and color quietly for hours at a time (are any kids that type?) but they LOVE coloring in pictures of themselves! I can already tell this project is going to fill lots of time this summer. I mean, cool, right? 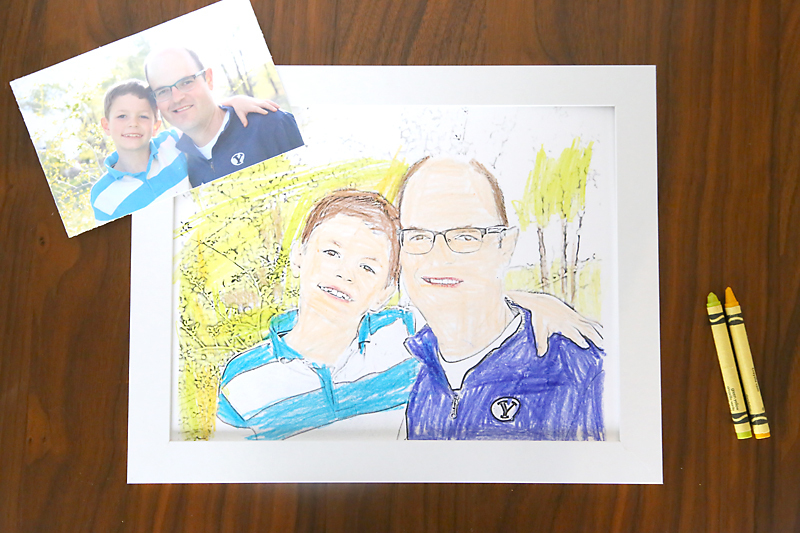 And wouldn’t the picture below make an awesome Father’s Day gift? I gave him a few tips on how to use water to blend the colors, and we were both pretty impressed with the final result! Personalized coloring pages from a favorite photo are extremely easy to make using Adobe Photoshop Elements. If you’re totally bummed now because you don’t have Photoshop Elements, don’t worry, just enter the giveaway at the end of the post! I’m giving away a copy of Photoshop Elements AND Premiere Elements this week. Thank you to Adobe for sponsoring this post & giveaway. Alright, here’s the how-to. This is dead simple and I made a screencast of the process so you can follow along. Some photos do work better than others, so if the first one you try doesn’t turn out great, give another one a go. Before you start the process in Photoshop Elements, you can use the Levels box (ctrl-L) to brighten the whites and darken the darks. This can help give a cleaner-looking result final. To enter to win a copy of Photoshop Elements and Premiere Elements, just leave me a comment telling me why you’d like to win. Must be 18 or older and live in the United States to win. Giveaway will close May 31st at midnight. Winner will be contacted by email (so please leave yours!) and will have 24 hours to email back to claim the prize or a different winner will be chosen. Love photo projects? Click here for 40 more craft projects you can make with photos! This is such a great idea! I really think my kids would actually sit and concentrate on their çoloring if it was pictures of themselves and people they know. Would make excellent gifts! I love this so much, Would love to win this would be a great way to introduce family members who have passed away . so that my grandkids can color there great pawpaw and stuff he like to do . They could make there on album of there family ..
What a fabulous idea! I have 2 granddaughters who live with me, and they are always saying we need to do an activity. This would be perfect. Would love to win so we can begin our art activity. This is awesome. I would love to win. It’s exciting to see what you’ve done with it and I’m excited to see what other things could be done. What a great way to create! I would love this so I could make some of these coloring pages for my grandsons. Thank you for the tutorial! What a great idea for grandkids. This is such a great idea! I would love to make painting pages for my disabled adult daughter who has fine motor impairments. She is unable to hold a pencil to draw and gets frustrated when others “do” her artwork for her. She would be able to water color an image with an adapted paintbrush and take such joy from having created something of her own that looks age appropriate. I don’t own Elements but would love a chance to! This would be great both for Grammy and the grandchildren. It would also be a challenge for me to learn these techniques. I would love to win this, I do all kinds of artsy crafts, and vinyl, glass etching designs. I come from a very large family and have copied all of our family photos and really NEED this Adobe Phoshop to enhance our photos for all the different projects I create! Love this technique, great intro to Photoshop for kids. While I would like to make pages for my grandson with pictures of the family, my primary thought is this would be a way to make the fundraiser coloring pages we have talked about in the pet rescue organization I am a member of. Rescue is expensive and we are always looking for ways to raise money to pay the vet costs for our dogs. A while back we discussed trying to put together a set of coloring pages but kind of let it go as we were either going to have to freehand pictures or “trace” from Xerox pictures. This would be so much easier. Children love my husbands artwork. I want to do this for me! I’ve got some great pictures that could be colored. My children would love to do this. 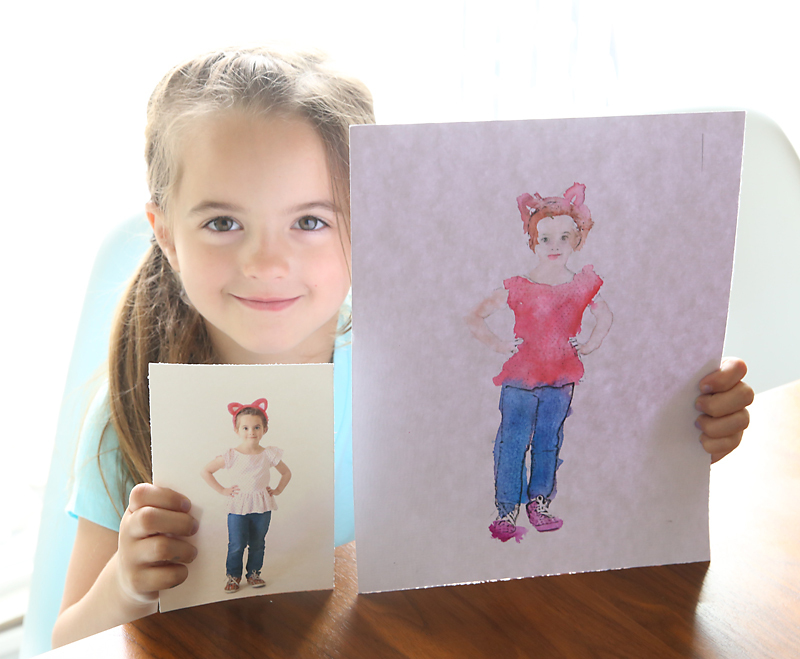 They are always drawing themselves, and I also think this could be a great “element” to add to our homeschool! Thank you for the opportunity! This would make great projects to do with my grandchildren. I’m always looking for something new to do. I love this. Pictures to art to gifts for everyone. Love !!! Thanks for the giveaway. What a wonderful idea! I am an artist, but I do not do pencil sketches. 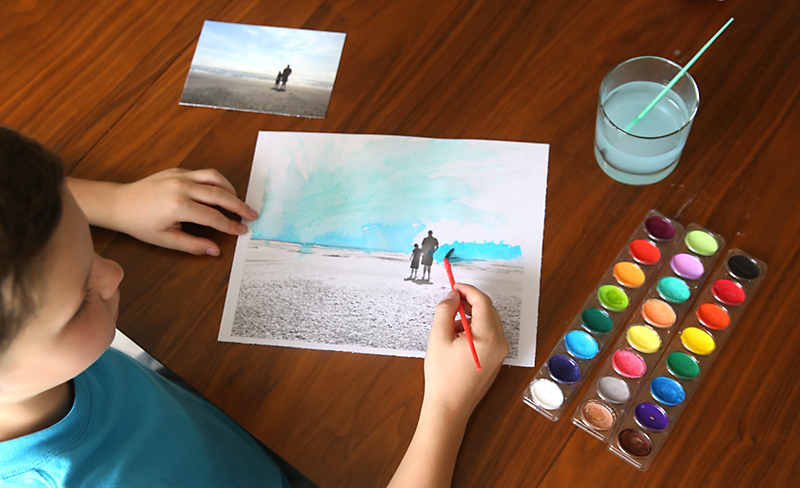 My grandchildren are wanting to learn to paint and watercolor and this would be a wonderful way to get them interested in learning to sketch and then use watercolors, pastels, crayons or any other medium to enhance subjects with which they are familiar. I also volunteer at our local grade school every week &n the kids would love to have pictures of their teachers, school and classmates to color for a special project. I can think of many projects to use this program to interest kids in learning basic skills. Adobe would be awesome to make coloring pages for my grandkids of their papaw, who passed away 2 months ago. What enjoyment that would bring them! Thanks for the chance! What a great giveaway! This will keep the grandkids busy for hours!!! Thanks for this opportunity. I’d love to win this so that I can try to use the sketch technique for vinyl cutting for some family projects. I think this an awesome idea that can be applied in many ways, and not just for children. in lots of other types of crafts. Perhaps using photos in a special quilt made for a family member. This is just a great idea! I love all sorts of art forms. And to be able to do this with my granddaughter would be fabulous. It seems as if Photoshop has many elements to explore. Thanks for the chance to win. Awesome idea! Thanks so much for sharing this simple technique with us! We are blessed with one beautiful granddaughter. Over the Memorial Day weekend please remember are soldiers who have given their lives for our country and the children who have grow up without that parent because of their service. Those children never have or will celebrate a Mothers Day or Fathers Day with their birth parent. My comment is to only make a point. The reason for a holiday is often overlooked. Thanks! This would be an amazing thing to do! Not just kids either. I would love it!! I’d like to win this because my grandchildren & great-grandchildren would realy enjoy it! I would like to win because a) I have six kids and it seems like we’re constantly coloring, b) I have six kids and school is almost out for summer and I may be in a bit of a panic, c) I have no Photoshop anything, d) I’m a really nice person. Thanks for the fun giveaway! This is such a wonderful idea! I live in Ontario and my granddaughter lives in Alberta. I would love to win this, then I could print the colouring photos of her and I and mail them to her so she could colour them . It would be such a treat for her to be able to colour pictures of her and together!! This is a great idea! It would give my kids a chance to make awesome gifts for family members! That watercolor one is truly awesome! I’d love to see that framed, or used on a scrapbook page. And I have the perfect shot of my grandson flying his first kite at the beach to do that with… if I had the program! For a while the BIG boxes of Crayola crayons had a link printed on them to a website where you could do this. I think a certain number of them were free… that still might be an option for those of us who don’t win that great PE giveaway! My 12 year old granddaughter is an excellent photographer. She and her 9 year old brother have been away from their parents since last August. We believe they will be coming home soon. This would be a great way to reconnect and share what’s happened during the interim. Even though they have had phone contact and weekly 1 hour visits, it’s going to be a challenge to successfully reunite. They will all be living with me for a while. My five year old grandson colors the most amazing pictures, with such great concentration. He would love to color pix of himself, but probably more of his mother, my daughter, because he just adores her. It would be so sweet if I could produce these for him. Hi there! I would love to win the adobe photoshop because I make a lot of activities and books for my daughter with autism. She loves art and I can envision many projects that would be motivating and fun for her. Thank you for the opportunity. I always wanted this program never was able to afford it. I would LOVE to win so that I can make these for all of my grandkids to color! What a nice surprise gift that would be to give their parents and “other” grandparents! (I would also love to be able to edit my photos…) Thanks for the giveaway! Because… that is one of the coolest ideas…EVER! I love this idea! I have several pictures that would be prefect for this process. And the kid’s in my family would really enjoy these. My granddaughter, age 10, and grandson, age 12, are coming from Florida to North Carolina to spend their summer vacation with us, their grandparents. We both are disabled and are not able to interact with them physically. They both bring a computer and spend most of the summer on their computers. I would be thrilled to win this wonderful prize for them to broaden their experiences?. This is something we could all do and have a new activity to share with them while making a whole new set of memories. I hope we win and many thanks for this opportunity!! My mother has Alzheimer’s and is she quickly losing her memory. Because her memories are priceless and she is trying to hold on to them, we often finding her looking at pictures of loved ones. Another favorite past time of mom is coloring in those beautiful “adult” coloring books. How great it would be to combine her favorite activities and create her own special memory coloring book. A book filled with many pictures containing memories of loved ones, fun times and happy moments for her to color. To allow her to hold on and stay with us for as long as possible would be the most wonderful gift. To find anyway to get back time would be awesome, but holding on to memories of happy times is truly a gift. Adobe your new product is a Godsend. Thank you Adobe for a wonderful opportunity to keep mom with us a little longer. Tonni, this is a beautiful idea. What a special way to bring joy and comfort to your mother. I can see wide applications for your idea with many people dealing with Alzheimer’s and traumatic brain injury. I don’t think my Photoshop 5.0 will do this….can’t find it anyway! I’d love to win. I’d give the copy to my mother so I could teach her how to use it, on her own computer. Love to color with my grandchildren so this would be so neat to make a “family” coloring book of our family tree or when they come to stay for a few days take pics of our adventures and create an individual coloring book of fun times had with grandma for them to take home and enjoy later! What wonderful craft. Crayola used to offer this, unsure they still do. Oops forgot to tell you why I would love vet to win this software. I would print it on fabric and use paint stiks to color it. Quilt around it and frame it! Amazing idea! Not only for children, but seniors and basically anyone who loves to color and paint! Another great project for the neighbor to come together. That is what I would get to do with this. Thank you for a wonderful idea! This is such a fun and personal project. I would love to try it with my great niece. I love Adobe software!!! I use AI and I’d love to use PS too!!!!! 🙂 Thanks!!! I think this would be awesome for my daughters wedding in September. We were going to make coloring books for the kids anyway…how neat would it be to make coloring pages of the couple and the kids!! They would LOVE it!! I would love to have this program so I could make the coloring pages. I am the guardian of two pre-schoolers, 4 and 5 years old, and am always looking for craft projects. They have difficulty focusing on regular coloring books but I am sure they would be interested in working on pictures in which they are the stars!!! We have pictures of roller skating, kite flying, hiking, swimming, sledding–all pics that would lend themselves to a child’s use of wild colors! Sounds like great fun! I love this idea! I can’t wait to try it with my grandson! We need this!! My kids would absolutely love filling our walls with artwork. My granddaughter would be fascinated by the process and enjoy the coloring of the picture Great idea! I can see so many uses for this program/feature. Wishes to win it and then use it! I have recently left my job and am in the process of moving to Alaska. 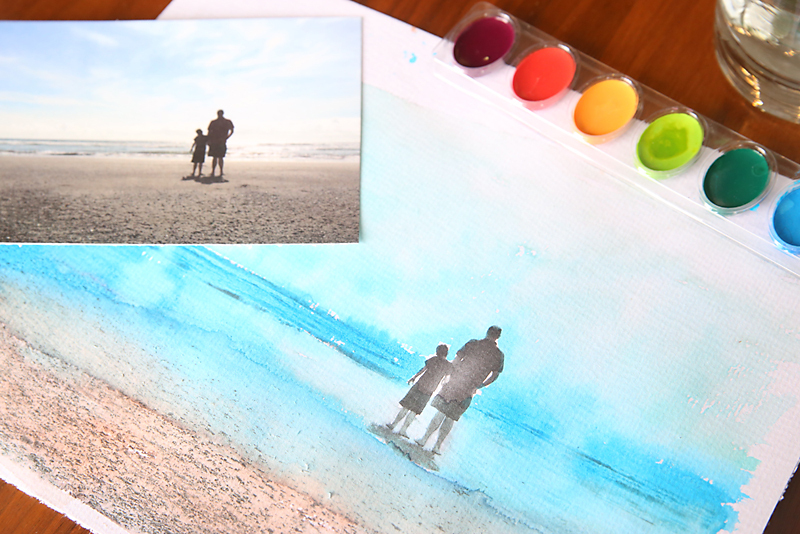 This would be a wonderful tool to convert and paint the photos of landscape and family. My 13 old daughter loves to paint too and this would bring a whole new concept to her art and creativity. If she were able to use the computer to turn HER photos into something she could paid herself, would be a boost for her confidence in painting something of HER own. I think this is such a GREAT concept. With so many “adults” getting back to coloring this opens a whole new possibility to make it “yours”. Thank you for the instructions and sharing. I would love to win but if not someone will be very happy. This is such a cute idea. My 6 year old would love it. Oh, wow, would my daughter and grandkids have a blast with these … and I’d get some really cool Christmas gifts out of it, too! I would love to win this and have my grandkids color for a family photo wall…would be unique and personalized. Both my 7 year old and my 4th grade students would enjoy coloring photos of themselves and others to give as gifts. Oh, I so need these programs! What a great way to be able to make my own gifts on a limited budget! And a great way to teach some young’uns to be a little crafty at the same time! 🙂 Love this! WOW what a lovely idea, I know that my grandson would love this. Being a little boy of 6 with a cardiac problem, he doesn’t get to play like other children, so we struggle to find things to occupy him with, and this would be awesome. I would love to win the photoshop. I am learning how to do so many things for my grand children and loving it. I am finding that making swings for stuffed animals put smiles on their moms face. Thanks for all you do for us who are learning. This sounds like a wonderful idea! My kids love to color and thry could create a wonderful family pictures. My husband is going through cancer treatment and thus would be a wonderful gift the kids could give him to bring to his infusions to look at. This is so generous of you!! I would really love Premier, as I have out-of-town company coming, with kids of all ages! Sure coloring would be fun, and I will definitely make a point of having them color a vacation memory while they’re here. But, I’d love to surprise them with a video combining pictures and video showing all their adventures here with their auntie. I just learned of this. I was asking around how to do this and someone told me about your post. We are having a family reunion and we are putting activities together. This would be auwsome. This is what I’ve been looking for! I am going to make coloring books for my grandchildren for Christmas using family stories and pictures. This will be perfect! Coloring pages are THE BEST therapy for my 5 year old grandson. He loves to color, and is very proud of his “coloring window” where his “art” is displayed. This would be super great for my grandkids and to share with my daughter who is a fourth grade English teacher. It would be a great tool for a beginning of the school year “getting to know you” project along with a short story about themselves for her home room. Then an end of the year project to see how much they have grown. I would love to have my grandkids put their personal touches on some awesome keepsake pictures! Just got the email – it’s JULY!!! Would love to have had this for the 9 year old artistic grandson we are raising!!! I want to do this on fabric!! I think it will be amazing. I take lots of floral photos that I hope will transition to a coloring page. Thanks for a fabulous idea! I would love to upgrade from Elements 11! What a great way to get some of the students I work with interested in photography and photo editing! This would make awesome reward projects to hand out. I would love to win Photoshop 14! Hi! I am a watercolor artist with a busy studio and gallery shows. I always like to have something for the children that attend. By having my own Photoshop Elements, I would be able to give these kids drawings of flowers, animals and trees to paint at the show or to take home. This would be an awesome program for me to create line drawings of my artwork so children can be creative using original artwork. Thank you for your tutorial and inspiration! Great gifts for Grandparents!! One of those gifts I too would love from my little girls! I would love to win this software – this would be cool to maybe get the family excited in learning about our relatives from the past. Love this my grand is alway wanting to paint my artwork. This would give them a chance. What a wonderful way to use our photos. I could make a mini book for a gift. Vintage family photos would be great to use. Thanks! Such a cool idea! I love cool and interesting projects for kids. Thank you for sharing. I love taking and editing photographs and this is a nice, interesting way to get kids interested in photography and art. Thanks again. Hi there, I’m not sure if you are doing the giveaway or not still but I figured why not try when it’s such a great idea. I would love to use this! I have 2 kids and 2 step kids, all varied ages so finding stuff that they are all interested in doing (and doing together) isn’t always easy..but coloring, painting, etc. Is something that definitely brings everyone together. If I were lucky enough to get this giveaway I would be so grateful (and all the kids as well). They all living taking pictures too so if they were able to color the pictures they took or where in the pictures they could color…..man they would love it. Having this would be awesome for my kids and maybe help my son with autism, spend more time coloring. It would also be great for my business. What a fantastic idea! My mind is reeling with ideas for Children’s Church, my grand kids, ladies’ ministry . . . and me! Thanks. OH my gosh – I would love to win this. Our son had twins very late in life – late 40’s in fact. They are now 4 and with every gift I send, there’s always a picture of them on the outside of the gift with hats, balloons, colorful sayings – anything to add color and now at this age they appreciate it so much more. I created a 500 page memory album starting in 1936 through May of this year with photos of the entire family, adding so much additional design to each page. Now I’m making coloring books for them and to each page I always insert a picture of the twins. It’s something they’ll have for years and years. I just don’t have the ‘creative’ tools to do what I want, nor can I afford. I do the best with what I have but know that there is so much more I’m capable of – even at the young age of 70! I want to continue the albums of their yearly adventures for as long as I can, the coloring books – I want to inspire them with artwork and crafts. Any consideration you can give will be SO appreciated. Thank you…thank you…thank you. This post has TONS of , fun, and inexpensive ideas for creative play. Thanks for the ideas and for the chance to win Photoshop Elements. I love the ideas you share in your newsletter. All of the above replies are so deserving to win the copy of photoshop elements. But, as I sit here among the scattered belongings of my brother’s children, I long for this family in particular to have such a tool to help remind them they do have a family, even if it has been torn apart by divorce so that some live with their mother, some with their father and another lives bitterly off on her own. They are such artistic children and love to color and paint, so this would be right down their alley! It would serve as a balm between them by giving them reminders of each other’s dear faces in remembered places together even as they are apart. There are five artistic girls who are affected deeply in their artistic painterly souls. I would very much like to win this for them as a family to share and use together! Please choose us. Thanks for sharing your ideas regardless. I LOVE this idea. I want to make one or two or more for me! My Mother would love one of her granddaughter. I found your site by looking for something to do for my 7 year old grandson’s Cub scout den party being hosted at my home (7 – 7-yr old boys!! )..and saw your photoshop picture idea. So cool! I’m’ also a site director for a before/after school program at our local elementary school. I have 120 students age K-6th grade, and while we have a “curriculum” we can utilize, 90% is what I and my team come up with. Using Photoshop elements may be my gateway to engaging my 6th graders at the same time helping the 1-3rd graders improve their skills. My students love art and creating things, but as so often the case, we rarely have budget for cool things, so its up to us teachers to figure things out…there is only so much slime you can make!! I would love to be able to do this activity with my grandchildren this summer! We are going to have “craft day at grandma’s” one day a week all summer.